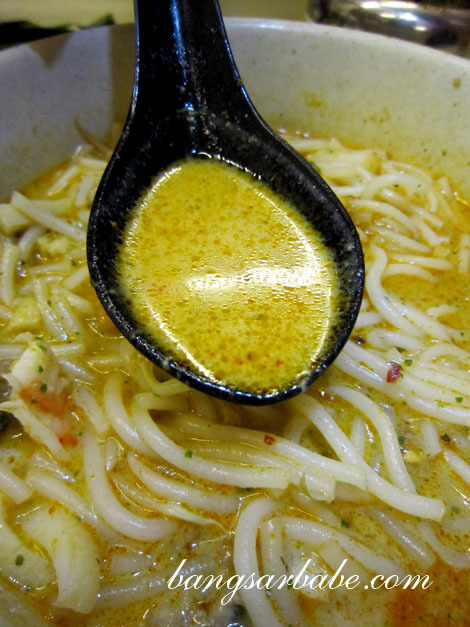 Laksa…there’s just something about it that screams comfort. The combination of noodles, bean curd, chicken and other ingredients in rich, spicy coconut gravy is addictive. 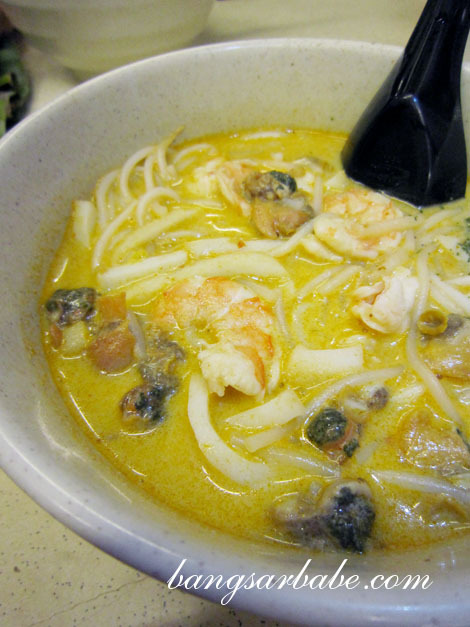 My favourite kind of laksa is the Peranakan version from Malacca for it is thicker, spicier and creamier. Crazy delicious, especially when my mother in-law makes it. 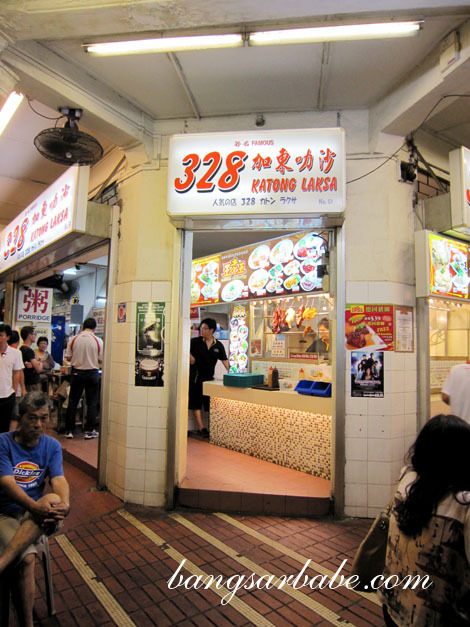 When I was in Singapore, Isaac took me for 328 Katong Laksa on East Coast Road, the heart of Singapore’s Peranakan community. We paid SGD5 per bowl (small – SGD4, medium – SGD5, large – SGD6) which came without chopsticks. “How am I supposed to eat this without chopsticks?” I was told that is the Peranakan way (Singapore Peranakan, I believe) where the noodles are cut into shorter strands and eaten with just a spoon. You can adjust the spiciness by mixing spoonfuls of sambal into the soup. I added two spoons because I like my noodles to be spicy. The curry broth was sweet from the coconut milk and the generous amount of fresh cockles gave it a hint of the sea. There was a sharp aftertaste from the daun kesum (laksa leaf) which helped offset the richness of the broth. I don’t think you get to choose the type of noodles you want – they only serve thick rice noodles. We also tried the Otah (SGD1.10), better known as otak-otak to Malaysians. 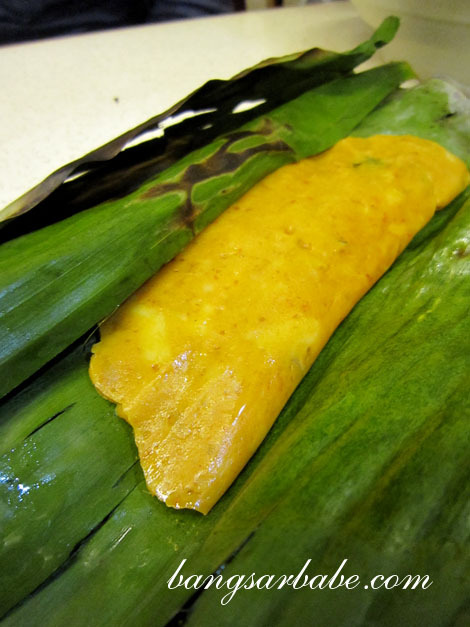 Wrapped in banana leaf, the mix of fish, coconut milk and spices tasted just alright to me – I like my otak otak spicy and very ‘lemak’. rif however, thought it was quite nice. Overall, the laksa was decent – it was not overly spicy with a good balance of richness. This is something I wouldn’t mind eating this on a regular basis as it isn’t overly cloying. Verdict: Simple, straightforward curry laksa. If you’re in Singapore, give this a try. I think u were meant to say without chopsticks, not spoon (see your post, after the 3rd picture). if i was back in brisbane, i would have darnit, where to get some, luckily as you would have read, i get a pretty good one in melb! Gosh… I miss this. I used to have this whenever I’m in Singapore. I’m not sure if they have nasi lemak, but if you visit the one across the street during daytime, the nasi lemak is pretty decent. Honestly, no big deal for this one. It doesn’t make sense to eat these slippery noodles without chopsticks and not providing them is simply atrocious.